In Perth, you can go to the shops and buy a bread pretzel for $4.80. If you want a cheese and bacon pretzel, I think they are $5.40 or something like that. A bit expensive if you ask me. Sooo, if I were to buy 1 pretzel for each of my 3 children, it would cost me around $15! 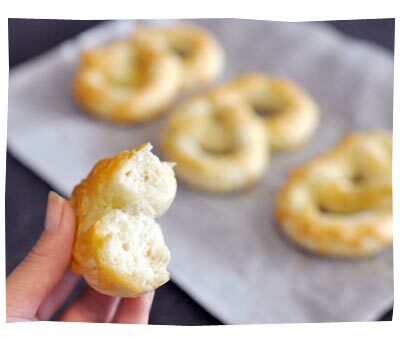 I looked up the recipe and made my own pretzels this afternoon. It was super easy. Baking with yeast is NOT scary at all. I even modified the recipe to make it even easier (it asked for bread flour, which I have NONE). My little blobs of pretzel dough! My plain pretzels. The bready smell is DIVINE! My cheese pretzels. Soooo soft and tasty, with a bit of crunch on the outside. YUM! 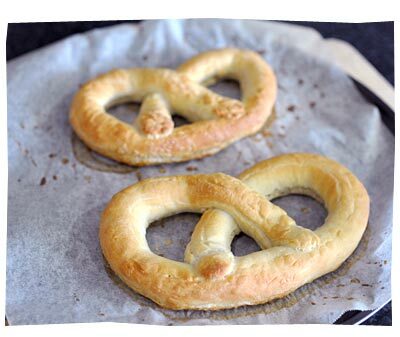 So when the kids come home from school, they can nom on some hot and freshly baked pretzels. I am so awesome. 1. Dissolve the yeast, sugar and salt in 1 ½ cups of warm water, into a large mixing bowl. 2. Stir in flour, and knead dough on a floured surface until smooth and elastic, for about 5 minutes. 3. Place in a greased bowl, and turn to coat the surface. Cover with cling wrap, and let it rise for 1 hour. 4. In a 20 cm square pan, combine 2 cups warm water and bicarb soda. 5. 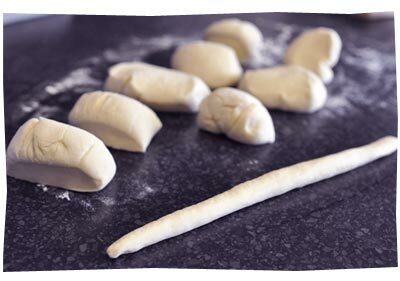 After the dough has risen, cut into 12 pieces. Roll each piece into a 30cm rope, pencil thin or thinner. 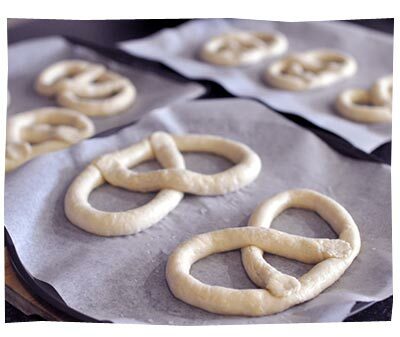 Twist into a pretzel shape, and dip into the bicarb soda solution. 6. Place on baking paper covered baking trays, and let rise 15 to 20 minutes. 7. Bake at 230C for 8 to 10 minutes, or until golden brown. Brush with melted butter, and sprinkle with coarse salt, garlic salt or cinnamon sugar.